You can help to make this a Greener world! Volunteer now. “With John’s death the Greens NSW and the NSW Parliament have lost an MP of enormous principle, energy and commitment. His colleagues have also lost a dear friend. “John was a tireless champion of public education, leading the national debate on education funding with an unflagging commitment to TAFE and public schools. “Public schools and TAFE colleges in this State are stronger, better resourced and more prominent in the national debate due to the work of Dr Kaye. “A lifelong commitment to public endeavour and social justice saw John campaign across the state in opposition to the privatisation of the state’s electricity sector. “The Greens NSW will continue to benefit from John’s work in establishing a clear path to NSW becoming the first state with 100% renewable electricity. 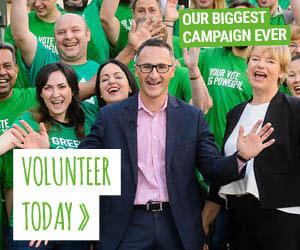 “John has always taken to heart his role as a Greens MP for the whole of NSW. “While John’s parliamentary work is deeply memorable, his community organising was extraordinary. “Preventing the disastrous Tillegra Dam in the Hunter valley was a personal highlight for John. He attributed this win to his ability to work with a spirited and united local community. “In the Illawarra John rightly took pride in developing, together with unions and workers, the Greens’ Steel Procurement policy. John’s Steel Industry Protection Bill is still before the NSW parliament. “John passed away after a struggle with an aggressive cancer which developed in recent months. He died peacefully in his home surrounded by friends and family. “Our thoughts today are with John’s partner Lynne, his sister and brothers Dina, Andrew and Stephen and their families,” Mr Shoebridge said.